HomozygousA cell is said to be homozygous for a particular gene when identical alleles of the gene are present on both homologous chromosomes. The cell or organism in question is called ahomozygote. True breeding organisms are always homozygous for the traits that are to be held constant. 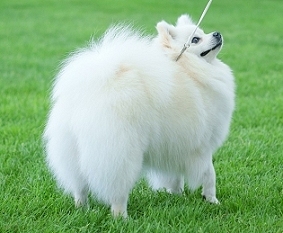 There are different types of white coats produced in Pomeranians, due to different gene combinations. 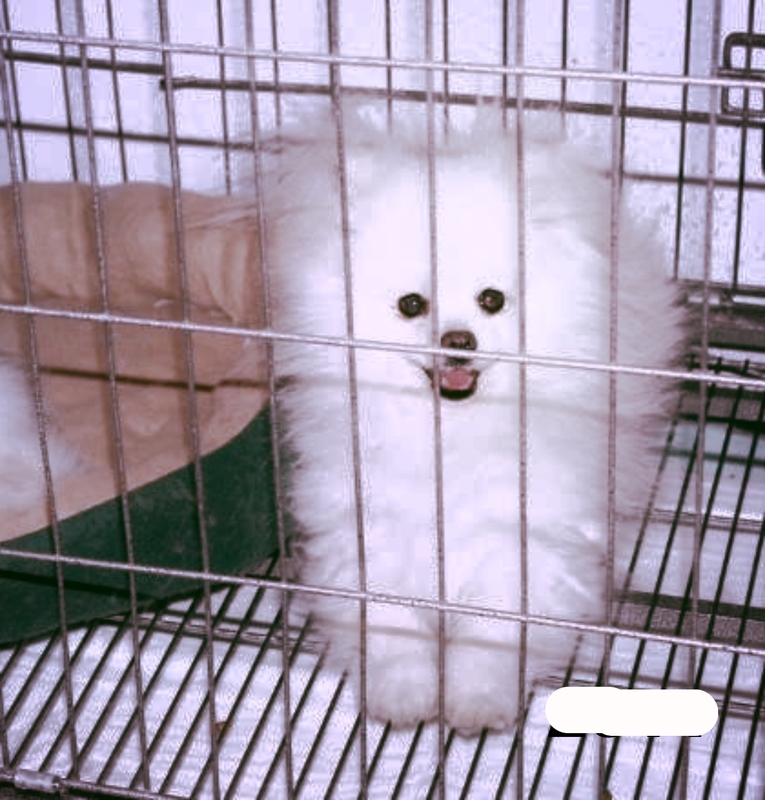 The Bright Clear Ice white coat in a Pomeranian such as The Ice White Knight of Camelot is due to his being homozygous for both recessive red (ee) and recessive black. This would be because recessive red stops the dog from producing eumelanin (black pigment) in the coat, ( it does not effect the nose pigment ) and recessive black stops it from producingphaeomelanin (red pigment) in the coat. The result would be a dog that couldn't produce any pigment at all in its coat, and so would be solid white (but with a fully-pigmented nose, because recessive red only affects the coat and not the nose, eyes etc). in Icees case he also carries a ressessive Sp gene .and so can also pass this gene on to his offspring . In the picture below is Icee with one of his Offspring that inherited (one) Sp gene from each parent ( Icee and the Dam ). So this white Pom on the left has the bright Luminescent coat of the Homozygous (Sp) Ice Whites that I produce . While Icee has the clear Ice White coat of the Ice White (e/e) that I produce . Until recently it was thought that the C locus was responsible for the intensity of phaeomelanin (red) pigment in dogs, causing the difference between rich Irish Setter red and the almost pure white seen on breeds such as the Samoyed and German Shepherd Dog. However, it has now been shown that ivory and white dogs do not have any mutations on the C locus. A new locus has been hypothesised for phaeomelanin dilution - I (for Intensity). The C locus is responsible for albino in many species of mammal, and generally lightens or removes all (melanin-based) pigment, not just phaeomelanin. It can also restrict pigment to certain areas, as in siamese cats. 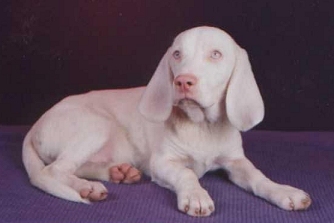 There are no known C locus mutations in dogs, and as yet no pure white dogs have tested positive for true albino. A true albino is completely unable to produce melanin, so it would be completely white with red/pink eyes and a pink nose. However, there is one gene in dogs that may be associated with the C locus, and that is the gene causing "white" Dobermanns. A white Dobermann is not entirely white and retains some very faint pigment, giving a ghost-like appearance. This is not true albino but an allele on the C locus may be responsible. As yet, no genetic testing has been done on white Dobermanns to see if this is true. The Beagle above is a possible example of the same phenomenon as white Dobermanns. The pigment is very pale with little, if any, colour visible. Both parents were tricolours, so it is not clear whether this very pale pigment is caused by a "fresh" mutation or a recessive allele. 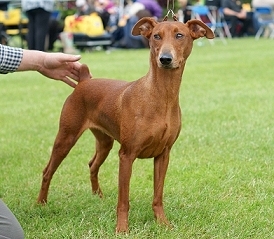 Dogs of this type do crop up every now and again in a number of breeds, but with the exception of Dobermanns they are very unusual. Dilution of phaeomelanin in dogs is now thought to be due to the Intensity locus. Currently, it is not known how this locus works or which alleles are present on it. However, the general idea is that is causes the phaeomelanin in the coat to lighten or darken. 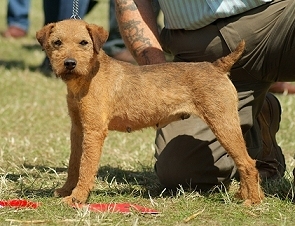 The above photos show the range of phaeomelanin colour in recessive red and sable dogs. The I locus does not affect eumelanin in any way, and so doesn't affect the nose or the eyes. 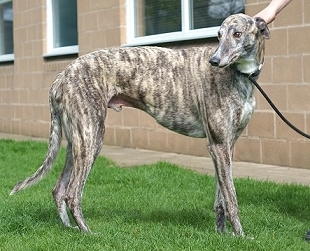 The "dudley" noses and unpigmented eye rims sometimes seen in dogs with light-coloured phaeomelanin are in fact generally due to the recessive red gene and not the phaeomelanin dilution itself. Genetic testing on Samoyeds has found them to be homozygous for both recessive red and recessive black. Some geneticists (such as Sue Ann Bowling) have suggested that it is this combination of genes which causes them to be solid white. This would be because recessive red stops the dog from producing eumelanin (black pigment) in the coat, and recessive black stops it from producingphaeomelanin (red pigment) in the coat. 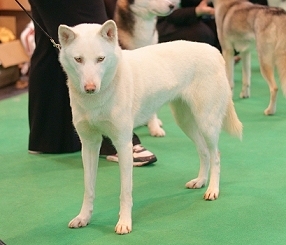 The result would be a dog that couldn't produce any pigment at all in its coat, and so would be solid white (but with a fully-pigmented nose, because recessive red only affects the coat and not the nose, eyes etc). This is certainly an interesting theory, but there are a few problems with it. Firstly, some Samoyeds have "biscuit" spots, which are small patches of cream, and some are even cream all over. This would not be possible if the dog could not produce phaeomelanin, because cream is very diluted phaeomelanin. This variation suggests that the white on Samoyeds is simply dilution and not due to the recessive red/recessive black combination. There are other breeds too which come in varying shades of white and cream, such as the German Spitz. 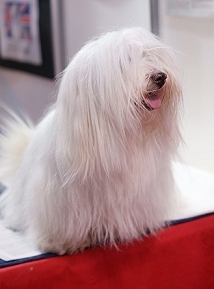 Secondly, solid white is known to occur in breeds which definitely do not carry recessive black. Towards the bottom of the page we deal with white Schnauzers, and these are one example. 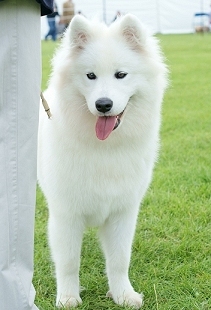 Cream doesn't occur in this breed (although the white is often an ivory shade), so in some ways it provides a better example of solid white than the variable Samoyed does. 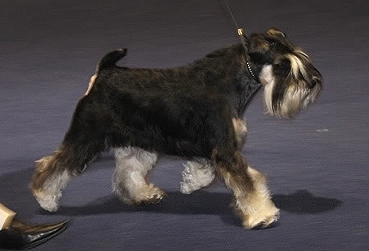 Yet Schnauzers are known to carry dominant black, not recessive. There isn't even a chance that they carry "hidden" recessive black, because they only have the at and aw genes on the A locus (a, which is recessive black, is also on the A locus). So overall, although it seems to make sense that a recessive black/recessive red dog would be solid white, there's no evidence to suggest that this gene combination is in fact responsible for white. It seems much more likely that it's simply down to an extreme dilution of phaeomelanin (red) on a recessive red dog. All of these dogs have tan points (atat) which have been affected by the Intensity locus. The Husky has some white spotting (probably psuedo-irish), which covers up some of its markings, but we can tell it has tan points because of the pattern on its cheek (which corresponds to the tan point pattern, as on the other dogs). This pattern is too regular to appear naturally in a white spotted dog. 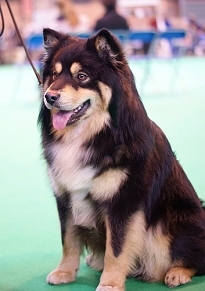 The Finnish Lapphund and Saluki cross have much more visible tan points, but still with some phaeomelanin dilution. Remember the main colour on a tan pointed dog can be black, liver, blue or isabella, and this applies to tan-pointed dogs with the Intensity gene too. I locus dilution affects any and all phaeomelanin in the coat, as these two dogs show. The first is a brindle and the second a masked sable. As you can see, the red in the coat is washed-out and greyish, but the black is unaffected. All of these dogs are examples of recessive reds (ee) and clear sables with the strongest red dilution. Their colour varies from cream to white. 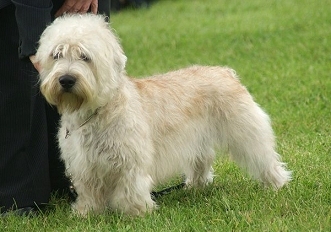 Breeds with this combination of genes include Bichon Frise, Samoyed, American Eskimo, German Spitz, Maltese, Bolognese, Akita, Shiba Inu, Saluki, Anatolian Shepherd, Labrador, Komondor, Puli, and Pekingese, among others. 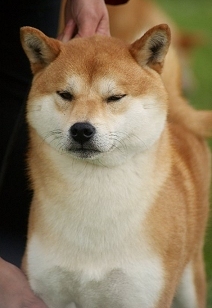 Some breeds of dog, most notably the Japanese Akita Inu and Shiba Inu, display a pattern known as "urajiro". Urajiro appears as white points, usually on a red dog. The points are located in roughly the same places as on a tan-pointed (atat) dog, but of course, normal tan points don't appear on red dogs, only black, liver, blue and isabella. No one knows which gene (or genes) causes urajiro, but it's possible that it is connected to the C or I series. One theory is that urajiro is in fact tan points diluted to white. For this to work, there must be a dilution gene which affects only the red found on tan points and not normal red. A red Shiba with urajiro would then be a recessive red with diluted tan points (which aren't usually visible because of the red body on a recessive red). 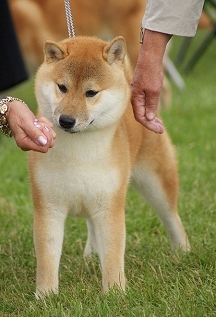 However, red urajiro Shibas often show sabling (known as "sesame" in the breed), which wouldn't be possible on a recessive red dog. They must therefore have ay on the A locus, meaning they can't have tan points, because tan points are also on the A locus. 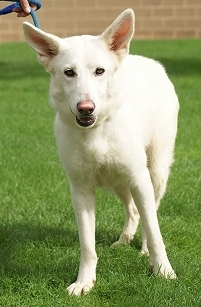 A second, and more plausible, theory is that the gene causing urajiro is a completely unique one which restricts pigment to the warmest (upper) parts of the dog, leaving the limbs, underparts and other extremities white. Only red areas (phaeomelanin) are affected. 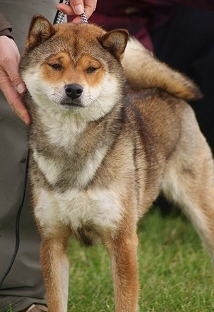 This can be seen on black and tan Shibas - the urajiro does not advance any further than the edges of the tan markings, unlike on sesame (sable) Shibas, where it often goes further than the normal tan pattern. Urajiro also doesn't seem to affect black masks. 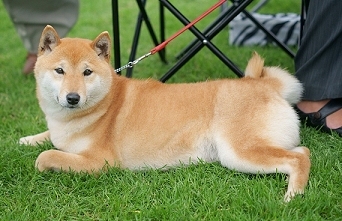 Heavy sable or agouti Shiba Inu with urajiro (causing only the tan in specific areas to lighten to white). Jersey here, belonging to princesstiffany from PCG, shows urajiro on a puppy and an adult. 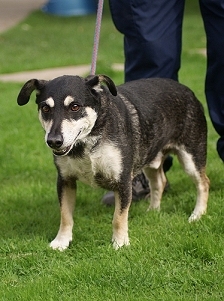 He also has a few white markings (on his chest, toes and trim), which are not urajiro. Notice how his black mask has not been affected by the urajiro. Interestingly, Shiba Inu and Akitas also come in a whitish colour (seemingly the same as platinum). This may be more than just a coincidence, and could indicate that urajiro is actually caused by thesame gene/s which normally cause phaemelanin dilution, except affected by some sort of modifier which restricts the dilution to certain areas. The cream/white dogs are simply those without the modifier. 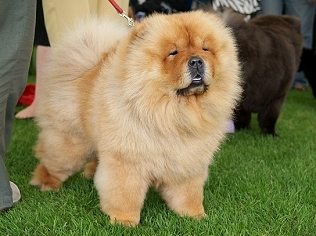 Alternatively, the solid cream may be caused by an entirely different gene, so cream/white dogs may also have urajiro, but it's just not visible because of the base colour. 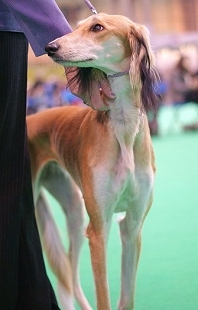 The Saluki and Pembroke Welsh Corgi above also show an urajiro-like pattern. 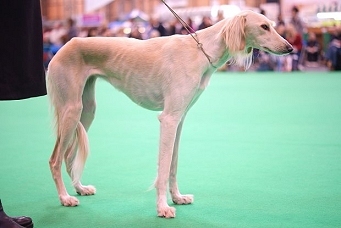 At first glance it looks like the Saluki has irish spotting, but the white goes up the inside of the legs and forms pips above the eyes, just like in urajiro. 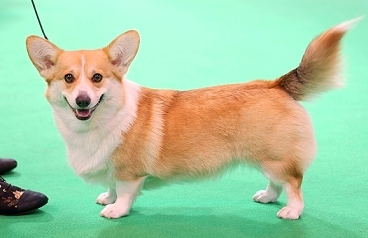 The Corgi does actually have irish spotting as well as the urajiro pattern. We can tell this by the very regular distribution of white on the face, forming symettrical cheek patches and eye pips. This is evidence of a pigment-restricting phaeomelanin dilution gene in breeds other than the Shiba Inu and Akita. It may be the same gene as urajiro, or just a very similar one. These two dogs show the affect of urajiro on tan points. The black areas remain unaffected (remember urajiro only affects phaeomelanin), so the urajiro areas do not extend as far as they may do on a sable dog. However, the tan areas have been turned to white at the extremities. 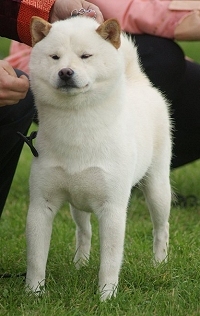 What indicates that this is due to urajiro (or a similar allele) rather than just blanket phaeomelanin dilution is that there is still fairly rich tan on the outside of the legs (see the Shiba Inus above - only the feet and inside of the legs are affected by urajiro), creating a tricolour effect. Urajiro affects all phaeomelanin pigment, so brindle dogs can be urajiro too. 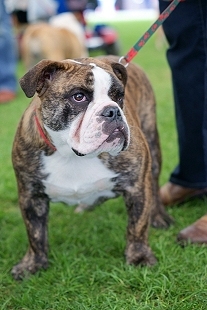 This Bulldog shows a lightening of the red brindle base on its cheeks, chest and the inside of its legs. The result is that the base of the brindle in those areas appears greyish rather than reddish, and this is most likely due to urajiro. 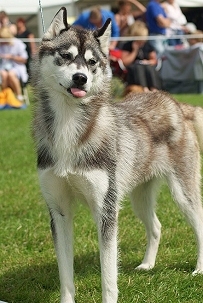 Huskies and Alaskan Malamutes have a very unique coat pattern, which usually consists of grey and black hairs on the back and head and white on the underside. How is this formed? There doesn't seem to be any sort of "official" explanation for the Husky pattern, but here is my own understanding of how it works. It appears that Huskies are dogs with the wolf grey/agouti pattern (awaw on the A locus, and kk on the K locus to allow the A locus to be expressed). Usually this appears as a dark sable-type pattern, but with banded hairs. Notice how there are scattered white hairs and white banded hairs in the grey areas. These would be red in a normal agouti, but have been turned to white by the blanket dilution of phaeomelanin caused by the Intensity locus. The black hairs and black banded hairs have been left dark because chinchilla does not affect eumelanin. The main difference between the Keeshond and the Huskies is that there is white covering a much larger area of the Huskies than the cream on the Keeshond. 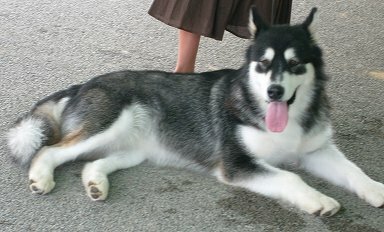 The final Husky definitely has some white markings, because it has an obvious blaze on its head. However, the rest of the white seems to occur in a very regular, symmetrical pattern, which is almost exactly the same on every Husky. It seems too regular to be caused by normal white, and also occurs in areas you wouldn't expect to see white in the irish spotting pattern (such as around the eyes and on the underside of the tail). But what does this pattern remind you of? It actually looks very similar to the urajiro pattern above, although it extends further. My personal belief, then, is that the Husky pattern results from the interaction of four alleles - wolf grey, I locus dilution, white spotting, and some form of urajiro (whatever that gene actually is). 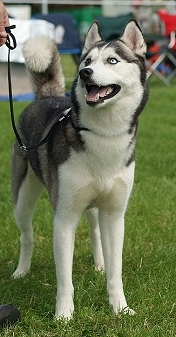 To understand how the combination of these three genes creates the Husky colour, we need to look at them individually. First, it is obvious that most Huskies are agouti (wolf grey), creating the scattered (and banded) black hairs throughout the coat, with the highest density of black/banded hairs being on the back and head. Second, we need to consider the effect of urajiro on agouti. The Shiba Inu below is either a sable or agouti - although for our purposes it does not matter which, as if it is a sable then it certainly looks very much like an agouti! It has urajiro, which has diluted some of its tan areas to white. 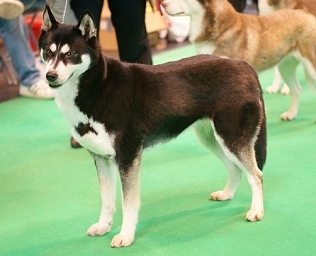 You will notice that the pattern of urajiro here looks almost identical to the 2nd Husky above, except the Husky lacks the rich red of the Shiba. The blanket I locus dilution may dilute the coat to anything from cream to white (whereas the urajiro always dilutes to white), which would explain the creamish cast on the coats of many Huskies (and why it is not necessarily the same shade as the white points). You may note that this Husky has more black/grey underneath its eyes and down the top of its muzzle than the Shiba does, or indeed the other Huskies on this page. This is probably just due to variations in the agouti pattern. This Husky is a heterozygous piebald, otherwise known as "psuedo-Irish". The fasinating thing is that the white colour on the Husky above is the result of 3 different "types" of white. The urajiro affects a very specific pattern of red (see the Shiba above), and the phaeomelanin dilution affects all the rest of the red. There are then white markings on top of this. 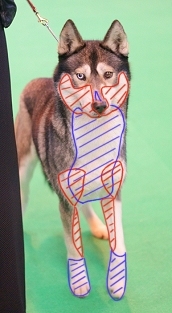 On this picture I have drawn red lines to show the parts of the white affected by urajiro, and blue lines to show the parts that are white due to the piebald allele (i.e. true white). All the rest of the coat is affected by I locus dilution, and you can see that these areas are more cream than white. This is particularly obvious around the eyes, where there are cream "spectacles" that are affected only by the I locus dilution and not by white spotting or urajiro. There are also creamish areas amongst the black hairs on the back. The urajiro (or just diluted red points on a wolf grey? Could be either in this case) is obvious on this dog. He also has white hairs inamongst his black hairs, indicating that he has blanket phaeomelanin dilution. But then, where do those traces of red on his legs come from? The I locus should have turned those areas to off-white. If he had urajiro but no I locus dilution, there is no explanation for the white hairs in the black areas (they should be red). I have no solution to this, unfortunately. The "four gene" theory seems to fit Huskies most of the time, but this dog has me stumped. If you have any ideas about this, feel free to contact me! Schnauzers are a very interesting set of breeds, colour-wise. When researching dog genetics I had great difficulty finding anything which related Schnauzer colours back to general genetic theory, so I thought I'd have a go myself. The Miniature Schnauzer comes in four colours - solid black, solid white, salt-and-pepper, and black-and-silver (in the traditional tan pattern). Salt-and-pepper is just like black-and-silver, but the black is replaced by grey. This is what makes the genetics of Schnauzers confusing - black-and-silver and salt-and-pepper look like they're caused by the same gene, but we don't know of any genes like this. In fact, I believe salt-and-pepper and black-and-silver are caused by different A locus genes combined with I locus dilution. This salt-and-pepper Schnauzer (photo taken by Jessica Pilhede) gives an important clue as to which gene is really responsible for this colour. Some of its hairs have black tips. Tipped/banded hair is characteristic of agouti (aw). Yep, this Schnauzer is wolf grey, like the dogs in the Husky section above. 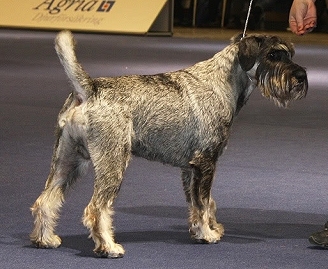 Many Schnauzers have very short fur due to stripping for the show ring, so often banding isn't visible. 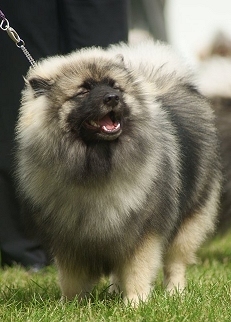 The white markings are a natural part of the agouti pattern - on the Keeshond in the section above they are cream, but on Schnauzers they are diluted to white by extreme phaeomelanin dilution, which also causes the scattered red hairs in the rest of the coat to turn to white (giving the salt-and-pepper effect). This black-and-silver Schnauzer (photo also taken by Jessica Pilhede) looks like it has the same pattern of white as the salt-and-pepper above. However, the white on this dog is caused by the tan point gene (at). Tan points are on the same locus as wolf grey, and produce a very similar sort of pattern, but the upper parts of the body are a solid colour with no banding. All Schnauzers have extreme phaeomelanin dilution. This means that agoutis become wolf greys (salt-and-pepper) and black-and-tans become black-and-silvers. 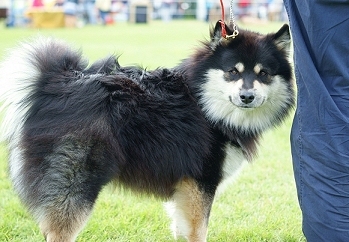 All of the phaeomelanin in the coat is affected, because Schnauzers don't carry any sort of urajiro like the Shibas above, even though they look a little bit like they do. Solid black Schnauzers have the dominant black gene (K), which stops the agouti locus patterns from being expressed. A black Schnauzer is genetically a salt-and-pepper or a black-and-silver, but is unable to express either of these. 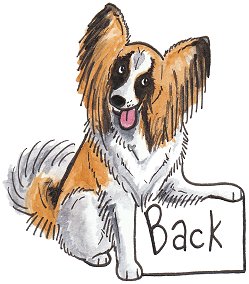 A salt-and-pepper or black-and-silver dog must be kk on the K locus in order to express its pattern. 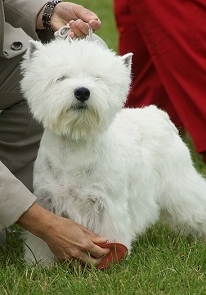 Solid white Schnauzers are genetically recessive reds (ee on the E locus). Recessive red turns all of their black hairs to red (recessive reds have a faulty mechanism which means they're unable to produce eumelanin, or black pigment), and then the Intensity gene turns them to white, leaving their noses and eyes unaffected. White Schnauzers can be genetically black, salt-and-pepper or black-and-silver. The combination of recessive red with Intensity is a fascinating one, because it's the only thing, except for white markings, which can hide any colour or pattern. There is nothing which can "override" it, because it stops the production of all eumelanin and dilutes all phaeomelanin, and these are the only pigments present in dog coats. All dogs with those two genes together will be solid white (or ivory), and it is impossible to tell which colour or pattern they actually are unless you know the family history or have access to genetic testing. awawKKEE - homozygous for wolf grey, black and normal extension. Will be black (genetically wolf grey). atatKkee - homozygous for tan points and recessive red, heterozygous for black. 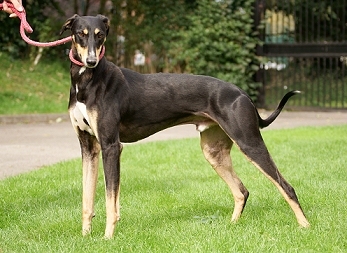 Will be white (genetically black and black-and-silver). 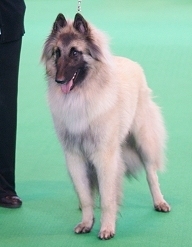 awatkkEE - homozygous for non-black and normal extension, heterozygous for wolf grey and tan points. Will be salt-and-pepper (wolf grey is more dominant than tan points). atatkkEE - homozygous for tan points, non-black and normal extension. Will be black-and-silver (this and atatkkEe are actually the only genotypes which will result in a black-and-silver, making it just about the most recessive Schnauzer colour). No time to read the whole thing? Here's the quick version! The intensity of phaeomelanin (red pigment) is now thought to be controlled by a newly discovered locus - "I" (previously it had been thought to be caused by the C, or albino, locus). It is not known how the Intensity locus works as yet, but it causes the difference between Irish Setter red and the cream/ivory of some German Shepherds, for example (and everything inbetween). The I locus does not affect eumelanin - this includes noses, eyes, eye rims and lips as well as eumelanin (black/liver/blue/isabella) in the coat. For example, on a black dog with tan points, only the tan points will be affected. 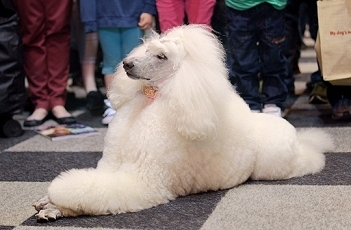 White dogs, such as Samoyeds, are most likely to be caused by extreme phaeomelanin dilution on the I locus. Urajiro is another allele possibly on the I locus, and it causes phaeomelanin to be diluted but only on the "points" of the dog (muzzle, chest, inside legs, hips, underside of tail). These areas are diluted to white or ivory while the rest of the phaeomelanin on the coat remains the usual colour (usually an orange/tan). Again, only phaeomelanin is affected, so all black/liver/blue/isabella areas will remain intact. Urajiro occurs most notably on the Shiba Inu and the Akita Inu/Great Japanese Dog, but similar patterns are also found in many other breeds. The "salt and pepper" colour on Schnauzers is caused by a combination of the wolf grey/agouti allele (aw) with blanket I locus phaeomelanin dilution, causing the mixed white/grey/black hairs. white is recessive so the parents must be homozygous white or heterozygous white to produce white. but there are a few problems with it. Firstly, some Samoyeds have "biscuit" spots, which are small patches of cream, and some are even cream all over. This would not be possible if the dog could not produce phaeomelanin, because cream is very diluted phaeomelanin. This variation suggests that the white on Samoyeds is simply dilution and not due to the recessive red/recessive black combination. There are other breeds too which come in varying shades of white and cream, such as the German Spitz.